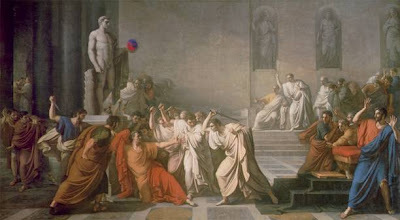 Welcome to the March 15 17, 2008 Carnival of Divided Government Unus et Vîcênsimus - Special Ides of March Edition. As explained in earlier editions, we have adopted Latin ordinal numeration in order to impart a patina of gravitas reflecting the historical importance of the series. In this, the Unus et Vîcênsimus edition, as in all of the CODGOV series, we select volunteers and draftees from the blogosphere and main stream media on the singular topic of government divided between the major parties (leaving it to the reader to sort out volunteers from draftees). Consistent with this topic, the primary criteria for acceptance in the carnival is to explicitly use the words and/or concept of "divided government" in submitted posts. A criteria that, to our endless befuddlement, is ignored by many of the bloggers submitting posts, which sadly results in DWSUWF reluctantly ignoring their fine submissions. CAESAR BEARUS STEARNUS: Who is it in the press that calls on me? I hear a tongue, shriller than all the music, Cry 'Caesar!' Speak; Caesar is turn'd to hear. CAESAR BEARUS STEARNUS: What man is that? BRUTUS JP MORGANUS: A soothsayer bids you beware the ides of March. CAESAR BEARUS STEARNUS: Set him before me; let me see his face. CASSIUS PAULSONIUS: Fellow, come from the throng; look upon Caesar. CAESAR BEARUS STEARNUS: What say'st thou to me now? speak once again. Beware indeed. Yon Dwsuwf-ius has a lean and hungry look. Alas - this post is two days late, but I had to wait and see the denouement of the Bear Stearns Shakespearian drama. 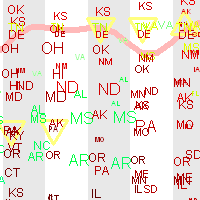 The show is over, and without further ado, the top 10 divided government posts and articles. "Now, as much as ever, we need divided government. They are all so incompetent and venal that it is in the national interest to impede them as much as possible within the structure of our institutions. I'd say that if you think that the Democrats will hold congress then you should vote for a Republican President; and the reverse." This was a return visit for Back40 to the Carnival of Divided Government golf course. Frankly I think he sliced that Weintraub shot out of bounds on the right. But he makes up for it with his concluding remarks on divided government - a hole in one. "This is all great news for McCain who can let the Dems scar each other up while he goes out and raises money and puts his national organization into place. The Dems chances of winning the presidency have always been low in my opinion. 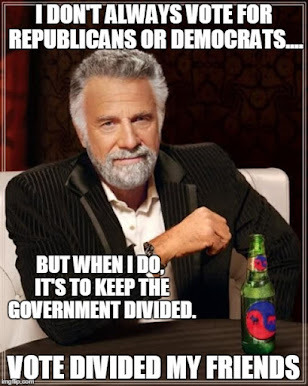 America’s fondness for divided government (they don’t really trust either party unfettered) means the Dems clear leads in the House and Senate would push many voters to look for a check and balance in the White House." Opinions differ on whether the Democratic inter-party squabbling helps or hurts. On the plus side, they are in the press everyday. Even McCain in Iraq cannot compete. On the minus side, are we sure that all publicity is good publicity? 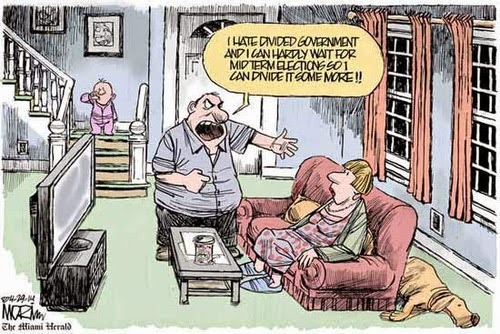 In any case, there is no argument about the American voter's affection for divided government. Mick Stockinger also weighs in on the Democratic primary battles, explaining that the Democratic voters are looking for "Absolution", posted at Uncorrelated. "This nation was built on the inevitability of conflict, which is why we have divided government designed to balance the forces of human nature--tyranny, greed and arrogance. Its supposed to be brawl folks.Barack Obama's promise of unity is either incredibly naive, or dreadfully omnious." Mick is also making his second appearance in the Carnival. Who knows, by the time we get to the general election season, there may be a real community of bloggers beating the divided government drum. "In other words, a vote for Obama is a vote for unified Democratic government. After the last 8 years of Bushism, the first 6 of which saw a unified Republican government run roughshod over checks and balances, divided government is the best answer to ensure that the worst legislative impulses are not pursued. We have already seen the dangers of unified government. While McCain has shown an ability to work across the aisle, he is still a conservative/Republican and as such will be able to check a Democratic Congress." "A month ago, I could see myself voting for Obama in November. My personal affection for him remains, but I am disclaiming the Dems now. They have shown me that they don't recognize the moment they are in and don't recognize the simple fact that Hillary is a godsend to the Republicans this cycle. This isn't limited to the Clintons, it infects the party down to its roots. So like Herod I am washing my hands of the Dems, even Obama, and backing McCain and divided government." Likely, this is the same conclusion that I will arrive at, but first need to reconcile myself on the issue of the war. No rush, I'll wait to see how the Democratic selection process plays out. "Bill Clinton bungled one-party rule at the start of his presidency, producing Speaker Newt Gingrich and a GOP congressional tide. One-party rule under George Bush was so inept by 2006 that voters gave Democrats Congress.... The lesson is clear: Divided government works best. One party checks the other, just as the three branches of government are a constitutional system of checks and balances. A monopoly, including a political one, stifles choice and leads to corruption. " Michael thinks that divided government works as well in New York state government as it does at the federal level. Could be. "I’ve created a timeline of the ebb-and-flow of party politics in the US Senate since the beginning of the modern two-party era. Beginning with the antebellum 35th Congress, and progressing through to the 109th, this timeline tells the story of the evolution of politics in America as played out on the floor of the Senate." Pretty cool. While not specifically invoking divided government, David's work is an interesting resource to explore for divided government enthusiasts. I plan on spending some time with it. "During periods of divided government, a lot of situations end up coming down to variations on the game of chicken between the president and Congress, and the side at a disadvantage will be the one with more to lose if neither yields. In general, this is going to be the party that expects government to actually do something--hence Patrick Leahy's complaint that "They [the administration] could care less. They dislike government. They dislike the way government works." True, but this is a structural disadvantage for liberals about which there's not really anything to be done." DWSUWF supports limited government as a goal and divided government as a voting heuristic to achieve it. However, there is a clear difference in pursuing limited government as an objective and deliberately sabotaging and handcuffing government agencies that already exist out of an ideological preference. This distinction apparently eludes the Bush administration. Failing to appoint leadership to Federal agencies does not promote or create limited government. It just creates bad government, inefficient government, and ineffective government. It is just stupid. "Dalam fungsi pengawasan, DPRD memiliki hak menyatakan pendapat, hak interpelasi dan hak angket. Hak-hak tersebutlah yang seringkali menyebabkan munculnya konflik antara Kepala daerah dan DPRD di Divided Government karena partai pendukung kepala daerah tidak mempunyai kursi mayoritas di DPRD." I just do not see how anyone can argue with that, given the situation in Indonesia. "I suspect Barack will be president whether I approve or not. Do you suppose the hapless Republicans can pull themselves off the mat Bush put them on long enough to win Congress so we can have divided government, the least objectionable outcome under our present system?" Actually I think the Republicans will manage to hold off a Democratic super majority in the Senate - but just barely. The rest seems like a foregone conclusion. "Does the fact that Bush was so much worse than Clinton give us reason to hope that things might not be so bad under Obama? We think not. Bush had a Republican Congress. So did Clinton. Divided government kept Clinton from spending so much, while unified government allowed spending under Bush to explode. If Obama becomes president it is probable that we will have unified government again, which portends another large explosion in government spending." When you say it like that, it just seems so simple, obvious and true. Probably because it is. Traditionally, we conclude this Carnival by including one "off-topic" submission, as a grudging acknowledgment and proxy for the many off-topic submissions received. Off-topic in this context meaning - no mentions of "divided government" or gridlock. For this edition, we selected Humorist, Haikuist and Hillaryist Madeleine Begun Kane. However, her limerick submission was on the topic of Ralph Nader, and since he is on my list of topics to not blog about anytime between now and when pigs fly, I instead went to her website and chose a recent Haiku which was more to my liking and is also on topic for several of our recent posts. And with that we conclude this edition. Thanks for stopping by, and thanks for all of the submissions (on-topic or not). The next edition will be the Carnival of Divided Government Duo et Vîcênsimus - Special Two Year Blogoversary Edition, which we will celebrate on or about Wednesday, April 23. Submit your blog article at carnival of divided government using our carnival submission form. Past posts can be found on our blog carnival index page. BMD presents "Economics and Social Policy XLVI" posted at The Boring Made Dull. Andrew Ian Dodge presents "Carnival of the Vanities to the Ides" posted at Dodgeblogium. Jill presents the "Carnival of Ohio Politics #108" posted at Ohio Politics. Rick Caldwell presents "Carnival of the Libertarians" at Frequently Asked Questions.